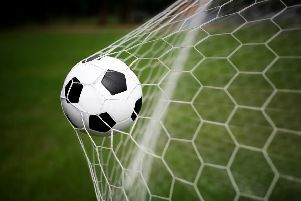 Two goals from Scott Jones helped set up a tasty Sussex RUR Cup clash against neighbours Pagham as Chichester City won at Broadbridge Heath in their semi-final. Manager Miles Rutherford said: “We look forward to playing Pagham in the final. I’m not dwelling on the fact that Pagham beat us 5-0 on Boxing Day. It’s one of those things. Since the Boxing Day derby defeat Chi have strung together an unbeaten run of five games, with consecutive clean sheets in the past three. Broadbridge Heath, though, have proved a stern test for Rutherford’s side this term. City lost at the Leisure Centre in the opening league game of the season and were held to a goalless draw at Oaklands Park in December. Chances came and went in a scrappy first half on a heavy pitch. A nice exchange between Charlie Williamson and Kieran Hartley set the Chi utility player up for a shot but it was way off the mark. Two minutes later a burst of pace from in-form Kaleem Haitham got him past a couple of defenders only for his effort to deflect for a corner. Heath keeper Michael Chester flapped at it. At the other end Chi No1 Ant Ender did well to push a fierce drive from Jake Holmes round the post after George Cousins had been given too much time. Chester was called into action to tip a Harry Williams free-kick over before Scott Weller cracked one against the inside of Ender’s left-hand post. Just after the half-hour, Ruben French got something on Lorenzo Dolcetti’s set-piece but the ball was smuggled away and the hosts should have done better after a neat series of passes ended up in a wild shot that failed to trouble Ender. Haitham continued to terrorise his marker and was a useful outlet for the visitors. As the interval approached Chester, who looked uncomfortable all night, flailed at another effort, Jack Lee wasn’t far off and Williamson’s cross-come-shot almost dipped in under the bar. A mix-up after 43 minutes got Hartley in. He teed up Luke Killner but the midfielder struck the upright. Chi started the second half brightly with mercurial midfielder Dolcetti orchestrating things in the middle of the park. Haitham had a chance three minutes in but couldn’t get his feet right. Gicu Lordache got through one on one with Ender but the keeper did well to slide out and push the ball away for a corner that Martyn Flack headed over. Killner threaded a pass to Jones and the Chi striker got a shot off but it was gathered easily by Chester. Holmes pounced on a mistake and broke into the area only to concede a foul. Haitham had a shot blocked, Hartley couldn’t quite reach a cross spilled by Chester and for Heath, Matt Nezval blazed over. Then Dolcetti stung Chester’s gloves. The deadlock was broken in the 73rd minute. Following a trip on Jones, Dolcetti swung a measured free-kick into the box and there was the leading scorer to beat Chester with a well-placed header. Jones doubled the lead a minute from the end, tucking away the rebound after Chester blocked his first effort with his 23rd goal in all competitions. The hosts might have got a consolation in time added on but for a quality stop from Ender. Rutherford said: “It was a scrappy game. There wasn’t that much quality in the first half. I thought the best player on the pitch was Lorenzo Dolcetti. I thought every time he received the ball he always looked like he had space. “To be honest, he was the only player who took a bit of time and got the ball down and tried to play, which is what he’s all about. He hasn’t really been the Lorenzo that we know for a few months now but he looked like the old player of old. “We huffed and puffed but we had one bit of quality into the box and Scott Jones has scored with his head, which is what he can do. We had the better chances of the game and looked the better team most of the game. Chichester: Ender, Williamson, Lee, Williams, French, Killner, Haitham, Pashley, Dolcetti, Hartley, Jones. Subs: Peake, Borges, Kanjanda, Turnbull, Hutchings.